Early history examines the archaeological record that tells the story of the first inhabitants of Georgia. Learn about the prehistory and culture of the first early inhabitants, and what lessons it might teach us about the early history of Georgia. 77 Million BP - In 2005 it was reported that paleontologists had identified a new dinosaur species, an early relative of Tyrannosaurus rex that roamed what is now the Southeastern US about this time. The scientists made the identification from hundreds of fossilized fragments collected mostly in Montgomery County, Ala., and southwestern Georgia. They named the new dinosaur Appalachiosaurus montgomeriensis, which means "the Appalachian lizard from Montgomery County." The 25-foot-long creature roamed the earth 10 million years before T. rex and was smaller and more primitive, with a narrower snout. circa 13,000 BC to circa 8000 BC - The Paleo Indian period. circa 1000-1600 - The Mississippian Indian period, these were the Indians who met the European explorers and settlers, and from whom descended the Cherokees, Creeks, Seminoles, and other Native American tribes. 1000 AD - 1550 AD - Mound builders occupied this area until the first European settlers arrived. The Mound builders were the earliest inhabitants of what is now the state of Georgia. 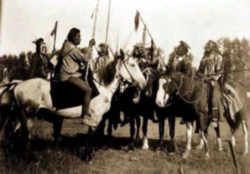 They were a group of Indians whose leaders lived in temples atop large earthen mounds. Their civilization was located in the northwest and southern portions of the state. The Mound builders occupied this area from 1000 AD until approximately 1550 AD when the first European settlers arrived. The names of the Georgia tribes included the Apalachee, Choctaw, Cherokee, Hitchiti, Oconee, Miccosukee, Muskogee Creek, Timucua, Yamasee, Guale, and the Yucci. The area we now call Georgia has been inhabited at least 10,000 years. The earliest known residents, the Paleo and Archaic people of BC 10,000 to BC 1,000, left little evidence of their communities beyond pottery fragments and spear points. Several burial mounds remain from the times of the Woodland people, who lived here between BC 1000 and AD 700. Larger mounds, such as those at Etowah near Cartersville, were constructed by the Mississippians of AD 700 to AD 1500. The Moundbuilders were a group of Indians whose leaders lived in temples atop large earthen mounds. Their civilization was located in the northwest and southern portions of the state. The Moundbuilders occupied this area from 1000 AD until approximately 1550 AD when the first European settlers arrived. 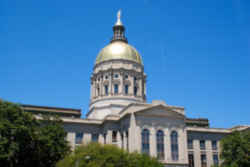 Other Native American tribes had also established cultures throughout the Georgia region. The Creek Indians lived in the south of the Chattahoochee River and the Cherokee occupied the northern part of the state when Hernando de Soto, the Spanish explorer, first traveled parts of Georgia in 1540. By 1566, forts were built along the Atlantic coast, including the first in Georgia on St. Catherine's Island. However, no permanent settlements were established. Prior to European exploration, the Indians of Georgia and other parts of the Southeast had achieved the highest level of political organization north of the Mesoamerican Aztec and Maya states. These southeastern political organizations are termed chiefdoms by anthropologists. A chiefdom, ruled by a hereditary and often semi-divine chief, was typically a multiple town organization, with a population in the low thousands. The chief resided in a capital town, with other towns paying tribute to support him and his family, part-time craftspersons, and military expeditions. Chiefdoms typically built impressive monuments. Etowah Mounds In the Southeast, Native Americans constructed large earthen mounds as platforms for the homes of their chiefs and the temples to their gods. Chiefdoms rarely exceeded twenty-five miles in diameter and were surrounded by large empty spaces that served as hunting preserves as well as buffer zones from political rivals. 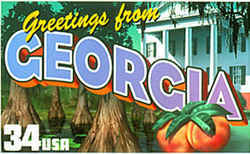 The present state of Georgia was the home of several chiefdoms. Through eyewitness accounts of sixteenth-century Spanish explorers and the archaeological record, we now know a great deal about these groups. Inhabitants of these Georgia chiefdoms had what archaeologists call a Mississippian lifestyle. The women were farmers, growing corn, beans, squash, sunflowers, and other plants. The men supplied meat by hunting and fishing, because there were no domesticated animals. They gathered other wild foods, such as herbs, nuts, and berries. Warfare was another major occupation for men of the chiefdoms. Both early Spanish accounts and archaeology reveal the importance of warfare in the lives of these people. Spanish explorers fought battles against large armies of Native Americans in the Southeast. Archaeologists have uncovered complex fortifications around native towns and have found direct evidence of war wounds, including scalping marks, on excavated skeletons of Southeastern Indians. Prehistoric art from archaeological sites, such as Etowah in Georgia, frequently depicts war themes.